First thing’s first, most gas stoves make a “clicking” sound. That’s the sound the stove makes when the electric igniter is trying to light the burner. But if you notice a “clicking” sound after the burner is lit or the burner doesn’t light at all, your stove may need some fine-tuning. Let’s go through some stove troubleshooting tips, so you can get back to preparing another home-cooked meal for you and your loved ones. Normally, when you first turn on the stove, you’ll hear a “clicking” noise. This means the electric igniter is trying to light the burner. If you hear a “clicking”, it doesn’t necessarily mean gas is running through the stove. If the burner fails to light up at all, the gas may be turned off or there may be a problem with the gas line connection. If you’re having trouble with your stove for any reason at all, watch out for the smell of gas. If you think you smell gas, shut off the gas supply, get out of your house, and call your utility provider for immediate assistance. 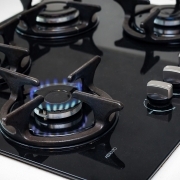 If you don’t suspect a gas leak, but your stove isn’t working, read on for some repair tips. When the stove is completely cool, remove the burner grate and realign the burner cap. The cap may be off center, leaning to one side, or covered in food. If it’s dirty, clean it off and make sure it’s firmly attached to the stove before trying to relight the burner. If you have a habit of using a lot of water when you cook or putting a still-wet pan on the burner, all that extra moisture may have put a damper on things. Make sure the stove is completely cool and try drying off the burner, including the cap and the grate, with a rag or some paper towel. Food tends to bounce around when you’re cooking on the stove. Food debris can collect around the burner and even inside the burner knob. Food crumbs and built up grease can disrupt the connection between the burner and the gas line. Keep your stove clean and remove any food debris from these sensitive areas. Always use caution when troubleshooting your stove. If you don’t feel comfortable trying to fix your stove or something feels out of place, stop what you’re doing and call a professional. If these steps aren’t enough to get your stove up and running again, you likely have a larger problem on your hands. You’ll need to call your utilities provider to make sure the gas line is working properly. You may also need to have a professional repair your stovetop. 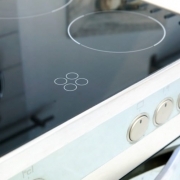 Contact the professionals at Absolute Appliance Repair for stove and cooktop repair in SF. We’ll help you get your stove back up and running in no time, so you can prepare another delicious meal. There is nothing sleeker and more stylish in a kitchen than a beautiful scratch free glass stove top. This new element can give any kitchen a modern look, and when not in use, can also serve as additional counter space when you don’t have a lot of room to work with. That is until you have to clean them. Sometimes a pot over boiling or a sauce dripping on the hot surface can leave you thinking you need an entire cooktop repair in SF. However, in most cases with proper planning, such a drastic step may not be necessary. Just like with any other glass around your home, cleaning isn’t always easy. You can spritz it with your favorite cleaner but that often leads to unsightly streaks that are hard to get out. And that’s not to mention the challenge of keeping those nasty smears and fingerprints that are often left behind. Here are a few tips that can help to keep your glass stove top looking as new as the first day you used it. When cleaning any type of stovetop, the best approach is to not allow any type of buildup to accumulate. Unfortunately, with glass stove tops, you can’t wipe them down until they cool. What often happens is you wander off and turn on the tv or get involved in some other activity and before you know it you’ve forgotten to go back and clean up the mess. When you do, you may find the grease and other foods have adhered to the surface making the work a lot harder than it could have been. To take care of this problem, start by taking a damp towel or sponge and wiping away any loose material. Then spray the surface with white vinegar to break up any greasy splatters or spills that may remain. Use a clean cloth to wipe the glass clean, leaving a sparkling shine. If it doesn’t come completely clean with the vinegar, then sprinkle the glass top with baking soda. This is a very natural cleaner that has just a hint of abrasive properties that will break down any hard to clean substances without scratching the glass. You may be required to apply a little bit of elbow grease, though. Rinse your towel out often and wring out any excess water so that you don’t end up reapplying the grease back to the surface. You will have to do this frequently until the surface is completely free of debris. Once it is completely clear of debris, go over the surface again with the white vinegar to restore its natural shine to the glass. Sometimes liquids and sauces can get really cooked onto the surface. When it is really baked on, you may find that you have to carefully scrape away the sticky stuff. You can do this with a razor blade but be careful not to press so hard that you damage the surface. Once the sticky debris is cleared, continue cleaning as usual. When you finally have your stove top as clean as you want it, do a final pass with the vinegar and buff it to a nice polished shine and your stove will maintain its new appearance for years to come. For all of your appliance repair needs in San Francisco, Absolute Appliances Repair has you covered; give us a call (415) 831-1259 at our San Francisco location today.